Easy to put together, you'll receive all fixings and full instructions, so you can assemble it quickly and simply and start using your seat in no time at all! 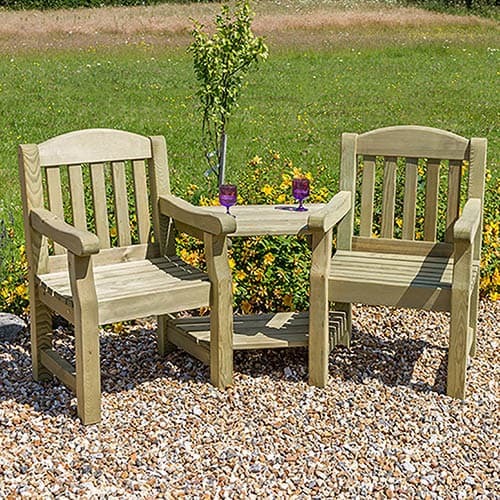 A romantic piece of garden furniture, designed for couples in mind, the Emily Love Seat has two chairs angled slightly towards each other, with a small table between the two. Enjoy a blissful evening with your significant other or delight in the company of your family or friends. The Emily Love Seat is manufactured from high quality, pressure treated, FSC® Certified timber to last longer, and comes with 10-year guarantee against rot so you can be sure that this product will last and remain to be a beautiful feature in your garden. Dimensions: 1.94m x 0.83m x 0.945m, assembly required - This product is 2-person assembly.